"The guys who did this used excavators. 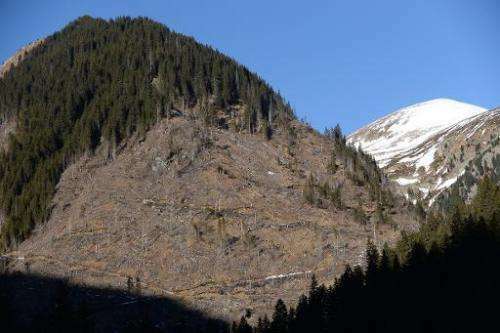 They even destroyed the young trees," said Gheorghe Ridichie, an official at Romania's forestry ministry, pointing to thousands of stumps poking out of the valley's now-barren slopes. Last year, authorities rallied to halt rampant deforestation in the Balkan state. But the draft law, setting stricter controls and heavier penalties for offenders, still awaits a vote in the lower house of parliament after making it through the upper house. Official figures show that in 2012, illegal logging in Romania—some of it in lush, century-old forests—had doubled over five years. "If this goes on, there will be no wood left for the economy and no forests to walk in," Minister Delegate for water and forests Lucia Varga told AFP. "Over the past 20 years, some 80 million cubic metres of wood were illegally cut, causing five billion euros ($6.8 million) in damage," she said. And "the worst part is that the pace of illegal logging is twice that of reforestation and regeneration." Similar problems exist in other east European states, notably Bosnia and Bulgaria. But some conversationists fear efforts to change matters may be too little too late. Both officials and conservationists blame the surge on several factors, including alleged collusion between local authorities and offenders, corruption in post-communist states, loopholes in legislation and an insufficient number of forest guards. The draft bill has angered forest owners and wood processors who fear it will create additional costs and legal roadblocks. Environmentalists, meanwhile, suspect some local authorities are part of the "mafia" that controls the trade. "The illegally cut wood is often accompanied by seemingly legal documents that are actually issued by dummy companies," Catalin Tobescu, president of Nostra Silva forest owners' association, told AFP. "When the authorities eventually decide to check on these companies, it is too late, they no longer exist and their managers are gone." In a robust sector with high demand, wood processing companies do not always check the origin of the raw material. Romania's own market is estimated at four billion euros a year, dominated by the 400-year-old Austrian firm Schweighofer which moved into the country a decade ago. Schweighofer's plans to open a fifth plant in Romania have annoyed conservationists and local woodworkers who say it will have an "irreversible impact" on forests here. But Schweighofer spokeswoman Theresa Willmann disputes this. The new site involved "a reorganization of the market", she said, and would create 650 jobs in the sawmill and an additional 2,000 indirectly. "The total forest fund in Romania will not be affected by the logs Schweighofer needs," she told AFP in an email. In a region that hosts Europe's largest old-growth forests outside Russia—and one that is home to 8,000 brown bears, 4,000 wolves and 3,000 lynx—Romania is not the only state threatened by deforestation. In Bosnia, whose rich, 43 percent woodland is greater than the European average of 32 percent, conservationists estimate that hundreds of thousands of trees are felled illegally every year. Mersudin Avidbegovic, the head of a Sarajevo-based association of forestry experts, said it was unclear "if this is to blame on poverty or on a mafia". "But the main reason is the absence of steps to fight illegal logging," he said. Likewise in Bulgaria, "illegal logging is an extremely serious problem," Neli Doncheva, Worldwide Fund for Nature (WWF) programme coordinator, told AFP. But authorities have passed a new penal code to try to end the scourge. Not only can companies breaking the law lose their permits and incur fines of up to $7,000 (5,000 euros), but offenders can get up to five years in jail. In Romania, the draft bill sets fines up to 3,000 euros and the state has undertaken an active reforestation effort to plant one million hectares by 2030. But Dorina Danciu of Greenpeace remains skeptical. "Even if we start planting trees now, it will take dozens of years for the scars left by illegal logging to heal," he said. "Environmentalists, meanwhile, suspect some local authorities are part of the "mafia" that controls the trade." When government picks winners and losers, you can bet those in government will also be winners. The article doesn't say, but it seems fair to assume the illegal logging is occurring on government land. Selling the land would solve the problem, as then the owners would call the authorities to have the illegal loggers prosecuted, and sued. As is often the case, environmental problems are on government property and or caused by government. Because then to deal with it, citizens sue the government, and essentially are suing themselves if they get anywhwere. Where the real winners are lawyers for both the governmnet and those representing environmentalists. Climate Change in the make. Of course, you don need global warming for that but as it happens denialists even try to deny that such (human) interneventions have an impact on the (local) climate. Nope --it's a direct consequence of markets that turn a blind eye to raw material sourcing, and occurs the whole world over, on both Public and Private land, 24/7, and especially in equitorial Africa, S.E. Asia, and South/Central America. The Libertarian Utopia you envision is nothing but a pipe dream.